Meaco DD8l Zambezi Review - New, But Is It Any Good? The Meaco DD8L Zambezi astounded us. It is the latest in a very impressive line of desiccant dehumidifiers made by UK company Meaco. It features a myriad of minor improvements which, when combined, really result in something quite special. All of these features are focused on energy efficiency and helping make this device one of the most intuitive and easy to use we’ve ever seen. We think you’ll be impressed by the Zambezi, as we were. And, after only a few uses when you begin to see how its ‘smart’ technology helps not only makes this unit stand apart from the competition but also, just how useful it is! The DD8L Zambezi is a product of innovation. Meaco have listened, and responded to, the needs of their users. That’s why the DD8L Zambezi has been in secret development for 2 years as these user-defined improvements have been developed (we’ll cover these in detail in the controls section of this review). 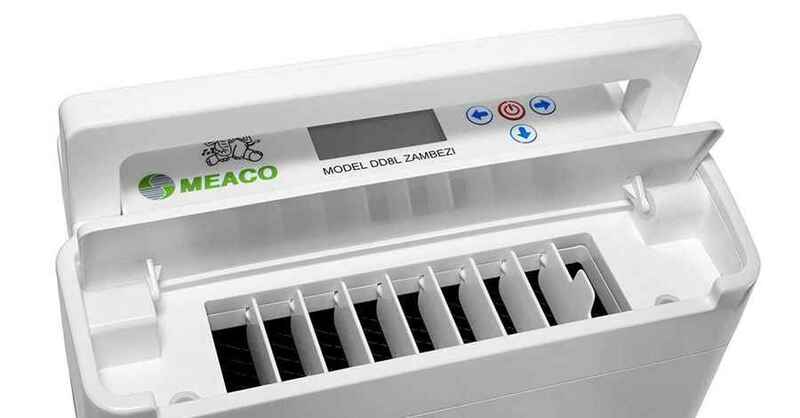 The end result is that Meaco has managed to create a unit which removes virtually all of the hassles which come with using a dehumidifier – all based on consumer feedback. The Zambezi is a powerhouse of a unit and, as such, is not the smallest dehumidifier available, and measures a fairly sizeable 35.8cm wide by 20cm deep by 54.8cm high. The saving grace here is that this appliance is remarkably light and weighs in at only 7.8 kilograms. This is light, even for a desiccant dehumidifier. And it is especially light when compared to much heavier compressor dehumidifiers which can often weight in excess of 12Kg. When you combine this low weight with its sturdy, folding carry handle lifting the Zambezi takes very little effort. When reviewing this appliance we found it no problem at all to not only pick up but move the Zambezi up and down flights of stairs with ease. Portability is an important consideration when choosing a dehumidifier because some other units, such as the Ebac Powerdri, can be difficult to carry because they are not only heavy but also lack a proper handle. And, at some time you will invariably need to move your dehumidifier around your home. 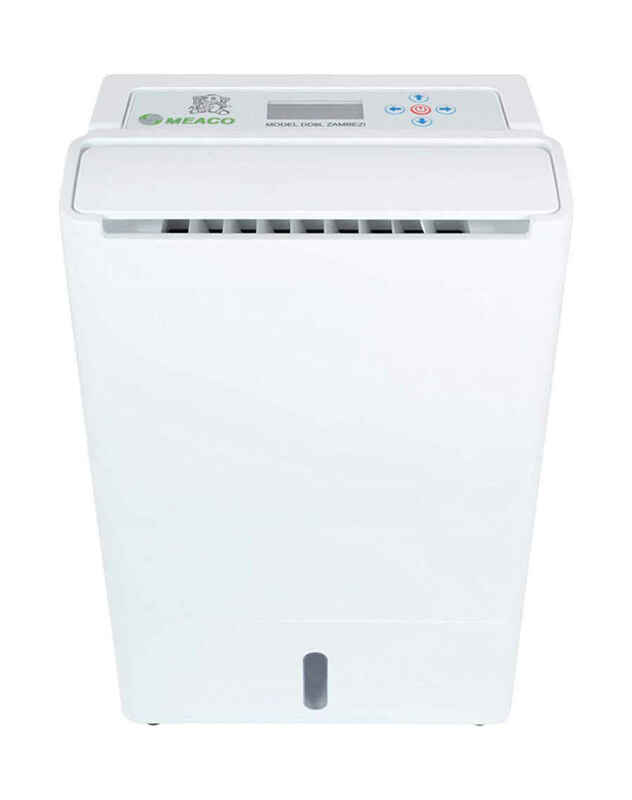 But before we move onto the features of this dehumidifier we would be remiss if we didn’t mention a little bit about how the Zambezi got its name. The name Zambezi refers to an Elephant orphan who was rescued in 2011 after being discovered, stranded in a swimming pool. 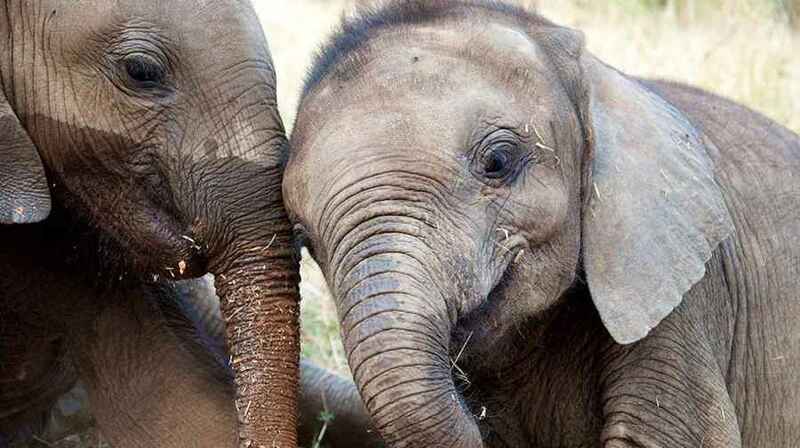 Since then Zambezi has been cared for by the David Shepherd Wildlife Foundation in Zambia. To help this foundation protect more animals from the dangers presented by man, Meaco have pledged to donate £2 from every sale of the Zambezi to this foundation. 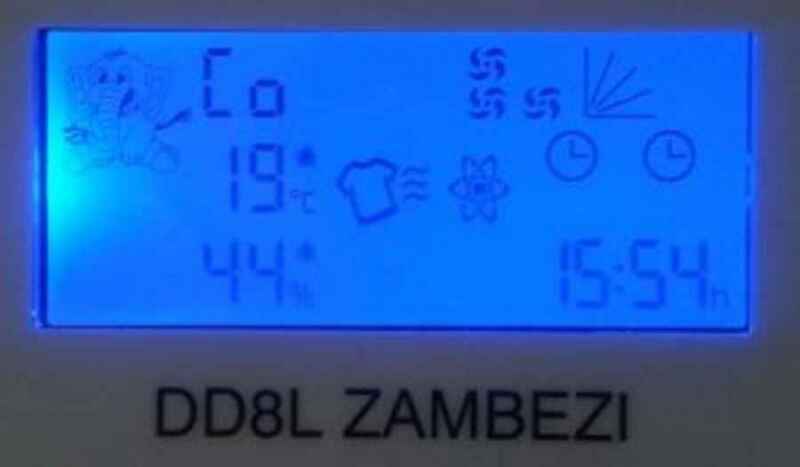 In fact, when opening the Zambezi, you will notice this units namesake image both on the LCD display and on top of the dehumidifier – easily identifiable by his distinctive tuft of hair on the top of his head! Whilst this has no bearing on the performance of the dehumidifier it is still a nice story with a happy ending and it is good to see a company behaving in an ethical manner by helping to protect our planets endangered species. Mounted on top of the unit you’ll find the Zambezi’s controls. 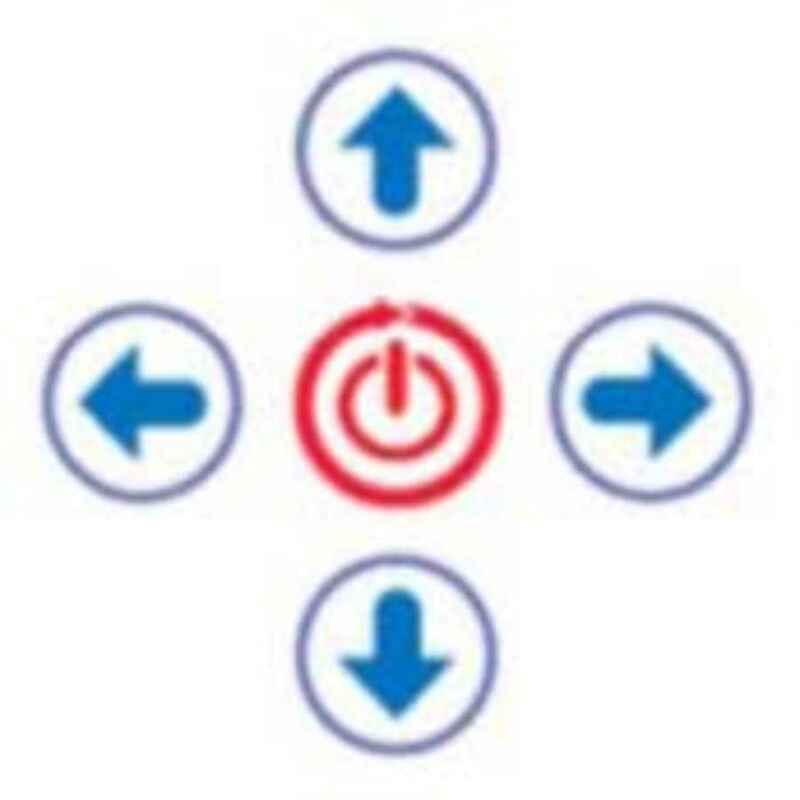 A simple ‘d-pad’ consisting of up, down, left and right buttons with a central power button is all you need to configure the unit. Once the unit is powered-on (simply by pressing and holding the power button for a few seconds) it’s small LCD display springs into life and glows a bright blue colour – making it easy to read in any light. Although the screen may appear initially confusing, with its myriad of icons, after a few button presses it becomes obvious what each setting the individual icons represent. The left and right arrows move you through each setting and pressing the up or down arrow adjusts the selected setting respectively. Then, when you’ve finished tweaking, you can simply wait ten seconds for the display to leave edit mode or press the power button once. 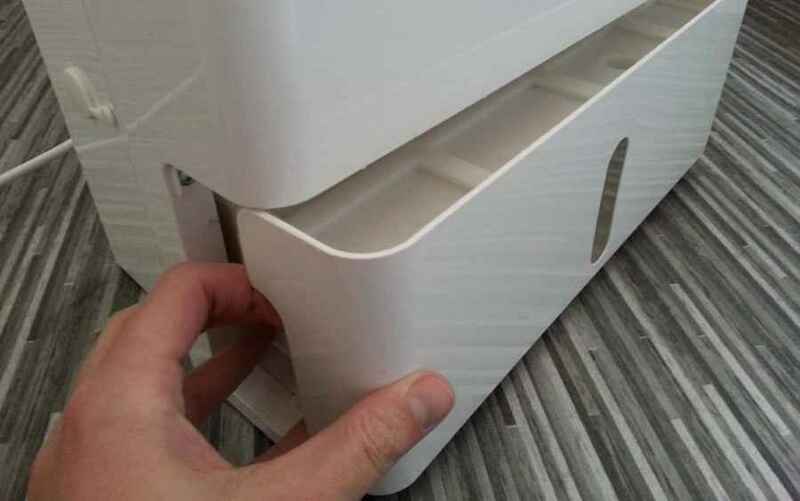 You can adjust everything from setting the humidity level (in very handy 5% increments which give complete control over the relative humidity in your home), adjusting the swing of the louver to activating the ionizer or setting the child lock (to prevent small fingers from tinkering with the settings). The Zambezi comes with an impressive selection of settings that allows for the fine-tuned setting of this appliance that gives you control not just control of the relative humidity within your home but also the running costs. Anbody who has owned a dehumidifier for any length of time, will know that a dehumidifier is really helpful at removing the excess moisture creating by drying washing indoors. This speeds up the drying time of your clothes and helps prevent to build up excess moisture and condensation that occurs when drying your washing inside. To accommodate this common requirement the Zambezi includes a ‘laundry dry’ setting to dry your washing when it cannot be hung outside. This setting really packs a punch thanks to its smart energy saving features and powerful louver which blasts your clothes with warm, dry air. The louver can be adjusted to rotate automatically at virtually any angle or on a widespread range. This allows you to focus the warm air on a single piece of clothing or across an entire drying rack. We tested this on heavier items of clothing such as thick sweaters and sweatshirts and found that it literally dried our clothes in half the time of our previous dehumidifier and, because of the air flow produced, made them smell much fresher. 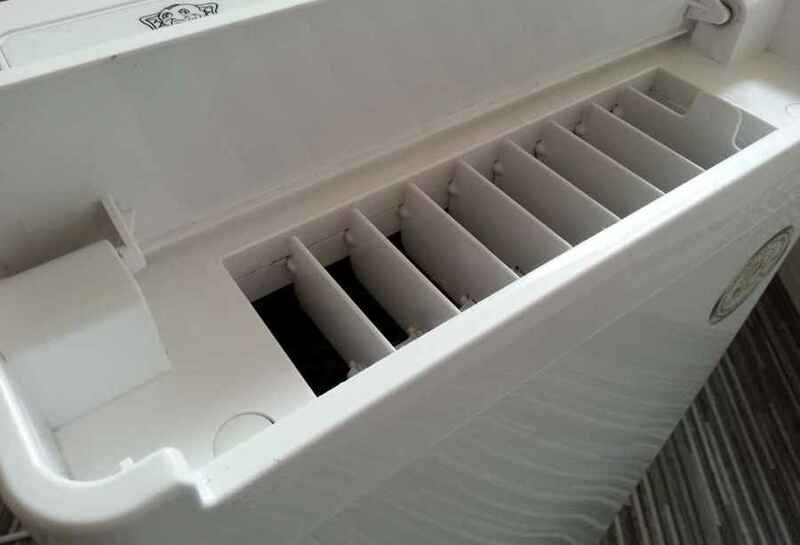 To complement the effective air flow produced by the louver the Zambezi knows when it should be using its dehumidifier or not and switches it on an off accordingly to save power. We were impressed to see this in action and could see on the LCD panel when this was taking place; whenever water is actively being collected an icon of Zambezi’s elephant counterpart can be seen happy and smiling. Not only did this device dry our washing faster when compared to our test using an Ebac unit but Meaco claims it can use up to 600 watts less electricity doing it too! When you have damp and mould in your home bacteria and spores in the air is a real concern. Such airborne particles can irritate asthma sufferers and are not healthy to inhale. To combat this the Zambezi features an ionizer technology usually reserved for use in hospitals. 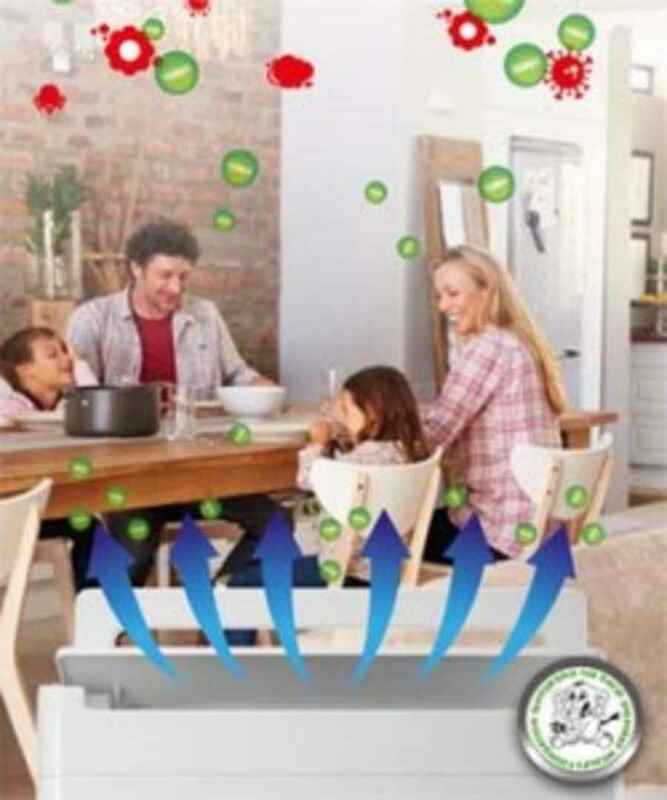 This technology is so effective it can neutralize dust, dust mites, bacteria, spores, mould germs and odours over a huge 10m radius. No other dehumidifier can match this level of performance with many only having an effective radius of around 1-2 meters. The secret lies in a ceramic, high voltage ionizer which releases hydrogen and oxygen ions into the air to create a cleaner, healthier environment in your home. Not everyone knows what setting to configure their dehumidifier at for optimum results. Generally, we want the dehumidifier to get the job done without it running up a big energy bill. Sometimes this can cause people to set the dehumidifier on too low a fan speed to save on running costs. But, this can sometimes mean the relative humidity isn’t being reduced enough to tackle damp and condensation. To combat this issue Meaco have introduced their 20+ logic system. This smart feature detects if the relative humidity has risen 20% above your desired threshold and then temporarily boosts the fan speed to bring the humidity under control before automatically reducing its speed to your desired setting. 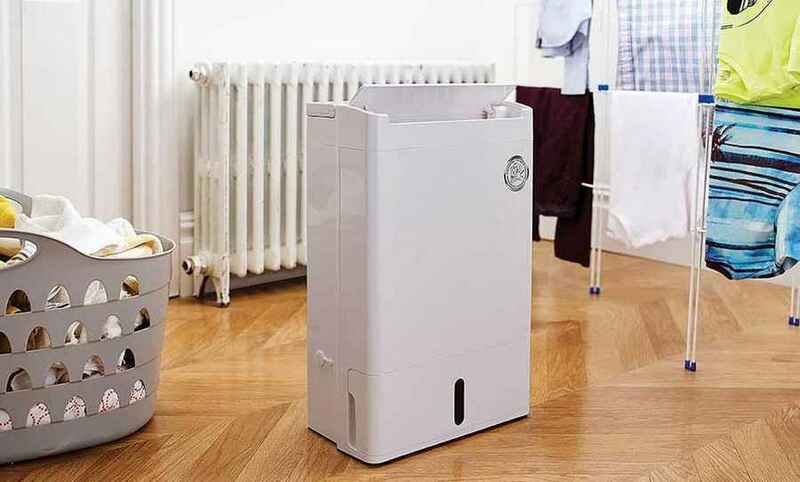 We’ve seen this in action and it is very impressive because it means you don’t need to babysit your dehumidifier to make sure it’s getting the job done. You can literally set it and forget it – because it knows what to do! We absolutely loved how smart the Zamebezi was when it came to feedback – thanks in-part to its impressive LCD display. Even the ‘tank full’ indicator features a subtly smart system. In most dehumidifiers when the tank is full the system stops and alerts you that it needs emptying. The problem with this approach is that often the machine is still draining the water it has collected from the air into the water tank. Then, when you remove the tank, water flows out of the machine in a steady dribble which then needs cleaning up. This is NOT the case with the Zambezi. When the ample, 3 litre collection tank is full the Zambezi will ensure all of the water has finished draining from the machine before alerting you that the tank needs emptying. This prevents any small leaks or spills from occurring. The unit will beep and the tank full icon will show on the LCD display. The tank is then simply slid out of the bottom of the unit and can be easily emptied. Emptying the Zambezi is simple. The tank is missing a carry handle which can sometimes make it tricky to carry and empty. Our only gripe here is that it would have been nice if the tank had some kind of carry handle to make carrying it to the sink a little easier. However, this is somewhat countered by the anti-mould coating on the water tank – which is a nice touch. You can also bypass the tank altogether using the supplied hose for continuous drainage should you not wish to empty it at all. In addition to the tank alert system the Zambezi also features a monitoring system which keeps a check on the humidity whilst the machine is on standby mode. If the relative humidity climbs above 70% the screen will show the word ‘Hi’ to alert you that you need to power on the device to reduce the humidity levels to help prevent mould and damp patches. As the name suggests the DD8L can extract up to 8 litres of water from your home every day. We placed the Zambezi in one of our problems rooms – the kitchen. We allowed two days worth of cooking and general use to occur without ventilation (which is common in the winter) or using any other kind of dehumidifier. Needless to say, we had condensation on the windows, the odd patch of condensation on the walls and the air had a ‘clammy’ feel to it because of the humidity. After placing the Zambezi on its medium fan speed setting and setting it to bring the humidity down to an incredibly low 40% (to really put it through its paces) we were shocked to see that it had not only dealt with every last bit of condensation it had also managed to collect full tank of water in only a few hours. The powerful air-flow expelled from the Zambezi’s top-mounted louver helps with its drying capability. This was very impressive. Especially since we used to have our previous dehumidifier running for full days at a time and it was still unable to get the condensation off the windows. This performance is certainly in part due to the Zambezi’s ability to warm the room it is operating within and the airflow produced by the top-mounted louver. In fact, with only occasional use over the past few days the condensation on the windows has completely gone – this is usually a permanent feature in the winter months. Is a desiccant dehumidifier – these typically won’t last as long as refrigerant dehumidifiers. The Zambezi impressed us with its effective performance, ease of use and impressive features that ensure the Zambezi intelligently regulates its performance to keep your home drier whilst keeping running costs as low as possible. As in many industries, manufacturers get lazy and continue to churn out the same old products again and again with only minor improvements. Meaco have really tried to shake up the market here by introducing something different and in-tune with their users’ needs, and we think they have achieved this with the Zambezi. We trialed this unit, in a deliberately tough environment and the Zambezi excelled. 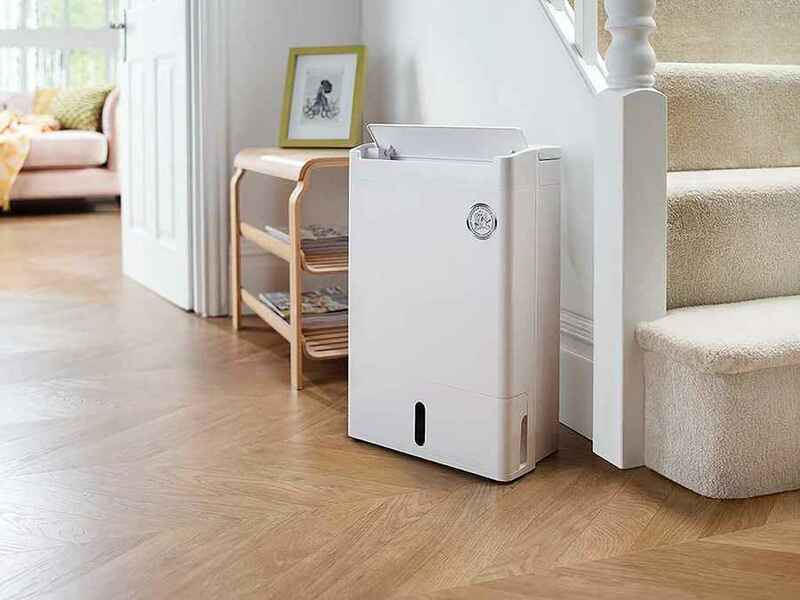 This device isn’t the cheapest around but it is well worth its price tag and, at the time of this review, we believe you’ll be hard pressed to find a better, more intuitive, dehumidifier for your home.